I have a list where I want give edit permissions at item level. I am aware of the item level permissions offered by SharePoint. What I am looking for is that I should be able to assign editing rights for an item in list to a specific user or group of users. The item should have read access for everyone. 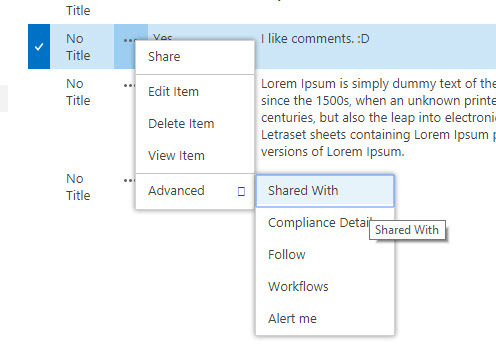 Is this possible in SharePoint 2013? 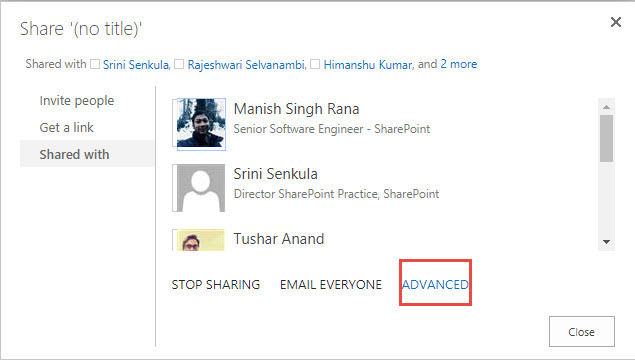 Yes, this is possible in SharePoint 2013. Go to the list where you want to assign item level permissions. Select the Item in which you have to provide the permissions. Then click on the ellipses -> Advanced -> Shared With and a new pop up will appear. In the pop up, click on the Advanced button. The permission groups for the item will be displayed on the page. Click on Stop Inheriting Permissions. Now you can add the user in any of the groups for the permissions that you want to provide for this particular item and can continue for the remaining ones. I should have searched a bit more! I found this MSDN article which details out how to do it in JSOM. I was able to create sample code for myself. Posting it here to help others. Not the answer you're looking for? Browse other questions tagged 2013 permissions splistitem item-level-permissions or ask your own question. How to restrict a document access to only one user.